This is the known Paradox reaction. Stronger than you would think. The Paradox V sits in Track’s top line so isn’t cheap. It’s an asym pearl and has reasonable value due to reasonable versatility. The Paradox V uses the I-CORE 2.0 (DUAL DENSITY) asymmetrical inside the Prime Pearl coverstock. 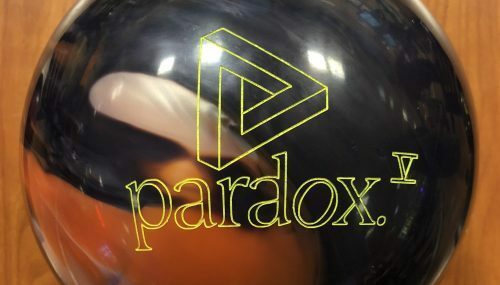 Not having tested any previous Paradox balls, it was great to finally get our hands on this very popular and successful line. I’ve seen it in action but unsure what to expect out of our own hands. It’s got the same cover as the Track Precision so in the back of my mind, I’m trying to figure out what Track is looking for. This is the third different core in some version of the Prime cover. So far we’ve liked the Alias and Precision. With the Paradox, you get a ball that is stronger than the Precision. It confounded me a bit at first. It seemed weaker as it was fluttering a bit and petering out. But then, I started getting more in after realizing I was in the wrong zone and the ball started to come into it’s own. This is a strong core with a harder transition. Despite being pearl, it’s a strong pearl so not super fast to friction. So long story short, you didn’t want to wing this out to the dry as it will lose energy. Core stands up hard and stops. You have to get in to catch some oil as it’s strong and keep your breakpoint miss area towards the inside. There, the ball really starts to come into its own. For me on house, it was trickier than I wanted to get good carry if I’m being honest. It’s just not quite the right condition match up for me. The Precision isn’t much different in terms of board coverage but didn’t feel as sensitive to the pattern. I think the core roll is a little smoother in the Precision which helps the transition to be a little more predictable. Justin was next. He’s way up in rev rate on me. You’ll see that he had room between 3rd and 4th arrow to get the pocket. Reaction shape is the same but a little less obvious because while I might hit a little soft with an off hit, he can overwhelm that slight miss with his rev rate to carry. Since our tilt and rotation is quite similar, you can really visualize what the extra rev rate does for this ball. The stand up characteristic still looked better from a little more direct so that it can turn over at the right time and drive through the pins. He could get into 4th arrow but it carry became more iffy. It just hooks and sets a bit too strong which reduces continuation from there. 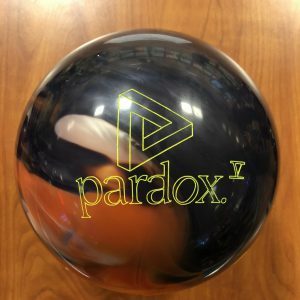 Generally speaking though, Justin had a very good look with the Paradox V. Compared to his Precision, it was clear the Paradox V is more ball. Sean tests the Paradox V and while he typically has no problem with pearl asyms, this was a bit strange. We quickly realized he was seeing the same thing but additionally, the ball felt a bit too release sensitive. Small variations led to pretty varying results downlane. He really liked the way it rolled and tumbled but just couldn’t gain confidence in the way it was going to hit. He found himself in a very over/under situation. It’s somewhat unclear whether surface change would positively affect his reaction but it just didn’t seem to match up ideally. We like the heavy core roll but it really appears too much ball for this pattern and the surface just makes it a bit too sensitive. Most likely for Sean and I, and even Justin to some extent, knocking off the shine will make this ball roll just a bit more consistently. That will likely make it require a bit more volume as well. Finally Bryan is up. Here’s where things took a surprising uptick. Bryan had a great look with the Paradox V. The ball seemed to have the right length for him with the cover but the core is clearly turning over hard and just setting so well going straight through the deck. He is able to take advantage of the “big ball roll”. So on this pattern, Bryan had the best look out of box. Justin had a good look. I was next and finally Sean. We tested on the 39ft PBA Don Carter pattern. On Sport, it confirmed my suspicion why this ball is so popular. You could see the kind of roll this ball has is conducive to control but still having a heavy, rolly characteristic. Of course, it also solidified that I need to get this shine off but I could easily make out what the reaction was telling me. Watching Justin’s reaction confirmed the same. His increased rev rate gives the ball a bit more zing down lane so he could get the ball to roll heavier. However, it still looks like on this sport pattern, the ball would be a really good match up if we just took the shine off. For Bryan, it was a continuation of what he saw from our house shot. He could do with or without the surface change. He really had a quite easy time finding the pocket quickly and getting the heavy roll through the pins. Ultimately, we can see why the Track Paradox line up has been so popular. The V continues the tradition with the same heavy defined transition and roll. Yes, we would like to take the factory polish off. Nevertheless, you can see what it offers to you. It’s clear that the ball benefitted the lower rev bowler with the core doing the business for him. The rest of us from medium to high revs may need to find less surface and more oil. Paradox fans will know exactly what they are getting with the V.